The Men’s Singles finals at the 1980 Wimbledon Championships found the then-king of tennis facing off with the new guy. Swedish champ Björn Borg had four consecutive Wimbledon titles and was aiming to secure a fifth when the skilled but hot-tempered American, John McEnroe, threatened to steal the title from him. The Swedish sports drama Borg vs. McEnroe follows the famous rivalry between the two tennis pros, played by Swedish actor Sverrir Gudnason and Shia LaBeouf, respectively, but the film’s title is a disappointing misnomer. 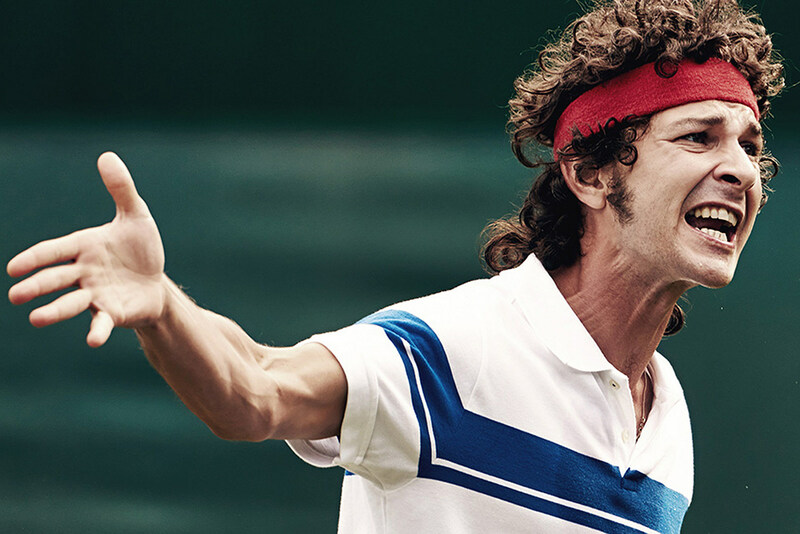 The Janus Metz sports biopic, which opened the 2017 Toronto International Film Festival, is a glacially-paced love letter to Borg’s legacy with a side of McEnroe, and fails to take advantage of an excellent LaBeouf performance. The film opens on Gudnason’s Björn as he silently does pushups along the railing of a luxury hotel balcony while looking ominously down into the pool far below. There’s something haunted and lonely about Björn, who, despite being loved internationally and chased by screaming teenage girls on the street, seems scooped out on the inside. While Björn is celebrated for his calm facade and precision on the court, the media quickly paints up-and-comer John as the perfect storybook villain leading up to the 1980 tournament. It’s the “SuperBrat” American, notorious for his out of control temper, versus Björn, who channels his inner rage into his game, appearing emotionless and composed. Metz (True Detective Season 2, Armadillo), directing from a script by Ronnie Sandhal, begins to sculpt an interesting portrait of the two players, suggesting the nemeses aren’t as different as they appear. Flashbacks show both as troubled young boys striving for perfection and stunted by severe self-criticism, but Borg vs. McEnroe doesn’t take the seeds of this any further. Instead of giving us a balanced exploration of both characters’ tortured psyches, Metz’s film is more interested in the silent, brooding Björn. And though Gudnason and both of Björn’s younger counterparts — played by Borg’s real-life son and tennis player Leo Borg and Marcus Mossberg — all do fine work, Björn’s story is a bit of a snooze. LaBeouf’s John, a firecracker of energy and anxiety waiting to burst at every moment, is the film’s strongest asset as it continues to sideline him. LaBeouf doesn’t have much of a physical likeness to the notoriously short-tempered tennis champ, which elicited some chin-scratching when the first photos and trailer dropped for the film. But he’s perfectly cast here, quickly proving you don’t need to look like someone to convincingly embody them. His twitchy energy as the young tennis player is consuming to watch as he squirms in his seat on a Johnny Carson-esque talk show, like a pipe waiting to burst. Later, when a press conference full of reporters ask him only about his temper and his opponent, a tight-jawed LaBeouf attempts to stay cool-headed until he finally erupts. Cursing out journalists, he barks, “Does anyone have questions about the tennis?” And when LaBeouf finally gets out on the court to recreate McEnroe’s ballistic outbursts, screaming about pigeons, throwing rackets, and hurling insults at the umpire as spit streams from his mouth, Borg vs. McEnroe is a sheer delight. That is the movie I want to see. It’s a shame the film doesn’t realize that John, despite being an unlikable jerk, is the character we’re rooting for and the one whose origin story we’d rather be watching. After all, an underdog’s story — and an underdog as compelling to watch as LaBeouf’s temperamental McEnroe — is endlessly more entertaining than the quiet stoicism of a celebrated champ who’s already secured his legendary status. Despite its sluggish build-up, the film finally kicks into high gear when the match we’ve been waiting for finally arrives near the end. Metz turns the face-off into a thrilling cinematic event, reminding us why the Wimbledon tournament was dubbed one of the greatest tennis matches of all time. Stylishly shot by cinematographer Neils Thastum and sharply edited, the final match scenes capture the fervor and ferocity of both men’s life-or-death obsessions with winning. The camera skips back and forth between Björn and John, getting up close to their sweaty faces then pulling back to gorgeously framed overhead shots above the court. What begins as a frantic sporting event turns into mesmerizing ballet as Metz shoots the final tie-breaking sets in slow-motion. Even as someone who doesn’t follow tennis, the film’s match had me completely enthralled. Borg vs. McEnroe isn’t a complete misfire, just more of a missed opportunity. Metz’s artful direction, the taut final match and LaBeouf’s rage-fueled antics are worth the ticket price alone. But it leaves you wondering how fantastic a full-on LaBeouf-McEnroe biopic could’ve been.